Marussia will run just one car at this weekend's Russian Grand Prix out of respect for Jules Bianchi. The Frenchman is in a critical but stable condition with severe head injuries after crashing in Japan. Marussia said they felt "fielding a single car, that of Max Chilton, is the appropriate course of action under the difficult circumstances". The team have built a second car, which will remain on Bianchi's side of the garage throughout the weekend. The two cars - Chilton's on the track and Bianchi's in the garage - will carry a graphic saying "#JB17". This, the team said, was "to ensure that although Jules is not with them in Sochi this weekend, he is nonetheless racing on with the Marussia F1 team." The F1 drivers are all carrying on their helmets a slogan in support of Bianchi, which reads: "Tous avec Jules #17" (all with Jules). Chilton said: "I don't know how to put into words how truly devastated I am by what has happened to Jules. "The support from the F1 family has been incredible and all we can do is be there to support Jules' family at this difficult time. It is going to be a very emotional weekend for the whole team, but we will try to get through it and keep praying for Jules." 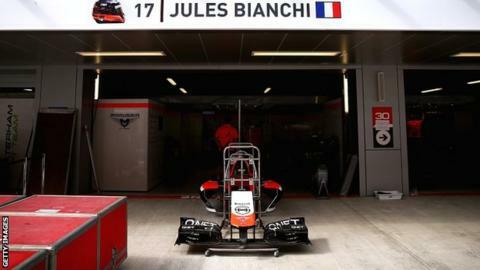 Marussia president Graeme Lowdon said: "The main thing we wanted to do was something useful for Jules and his family. "But also we're lying ninth in the world championship, a very important position for us and we're largely in that position because of Jules. "He's a racing driver and he will want us to do the best we can. "We thought the right thing to do was come here, take part in the event but as a mark of support for Jules and respect for his mum and dad and family we would withdraw the second car. "It was something we could do and it has been useful for our team as well. They wanted to do an expression of support for Jules. If it makes even a small difference, it makes one in the right place." Bianchi's car hit a recovery truck that was removing the crashed Sauber of Adrian Sutil after the 25-year-old lost control in wet conditions in the Japanese Grand Prix. Governing body the FIA has commissioned a report into the incident by race director Charlie Whiting. The F1 drivers have all said they will work with the FIA to ensure the introduction whatever safety changes are deemed to be necessary in the wake of the accident. Marussia team principal John Booth remains in Japan at the hospital in Yokkaichi where Bianchi is being treated, to provide support for the 25-year-old Frenchman and his family. Read more on Jules Bianchi: What lessons can F1 learn from Japan crash?